Lewis Wright in Sport on 31 December, 2016. It has been a truly unforgettable year of Premier League football in 2016, in which Leicester City unexpectedly led the way from New Years’ Day until the end of the 2015/16 season in May, Mauricio Pochettino’s Tottenham Hotspur remarkably fell from grace to miss out on an inaugural title of their own, and four-time Premier League winners Chelsea stormed from 14th position on day one of 2016 – tied on 20 points with both Bournemouth and relegation-bound Norwich City – to sitting pretty in 1st place as the world welcomed in 2017. However, after much deliberation and consideration of all the good, the bad and the ugly that we have seen over the past 365 days, it is now time to publish my ‘Premier League Team of the Year’ for 2016, starting with a goalkeeper who has followed in his father’s enormous footsteps to lift that illusive trophy, and continuing with a back four who have proved their worth and more over the past 12 months. Leicester City goalkeeper Kasper Schmeichel followed in his father’s footsteps to win the Premier League title in 2016. Having represented nine English clubs throughout his professional career, as well as being the undisputed Danish No. 1 since making his international debut in 2013, Kasper Schmeichel’s only previous successes as a goalkeeper came in 2009/10 and 2013/14, as a major part of Notts County and Leicester City’s League Two and Championship winning campaigns respectively. But that all changed in 2016, as the Dane finished only his second full campaign in the Premier League with a total of 15 clean sheets, as well as an incredible third league title, to follow in the footsteps of his famous father Peter – the first biological son in history to do so. Since cementing his place in the Tottenham Hotspur first team back in 2011/12, Kyle Walker has become one of the top full backs in the Premier League, alongside securing his position at right back for the English national side. And although 2016 will by no means be a year that Walker will wish to remember too fondly – as a Tottenham player who missed out on the title and eventually fell below great rivals Arsenal in the league title, as well as a member of an England side that was quite simply embarrassed by Iceland at the European Championship in France over the summer – the pacey ‘wing back’ has undoubtedly earned his place in this side in 2016. England full back Kyle Walker has enjoyed an excellent 2016. Partnering Walker as a vital member of a resilient Spurs back four, Toby Alderweireld was the first defender in my 2016 team of the year, after consistently performing at the top of his game over the past 12 months. 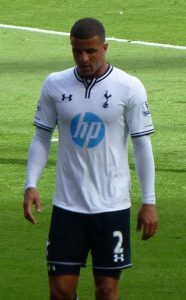 The former Atlético Madrid centre back earned a permanent move to White Hart Lane in the summer of 2015, and his first campaign for the North London club finished with two player of the year awards from various supporter branches, as well as a place in the coveted PFA Premier League Team of the Year at the heart of its defence. While the loss of Alderweireld might have been a major blow for fellow Premier League side Southampton, the South-Coast club replaced the Belgian with a 25 year-old Dutchman who is no stranger to making Teams of the Year, and his acquisition has filled the gap left by the Spurs leader. Since his £13 million move from Celtic back in September 2015, Virgil van Dijk has starred for the Saints, helping goalkeeper Fraser Forster amass a total of seven clean sheets already in this campaign, while contributing towards the development of his central defensive partner José Fonte’s form over the past 12 months as well. Southampton defender Virgil van Dijk has been a welcome addition to the Saints back-line since joining from Scottish giants Celtic. Now into his fifth season with London giants Chelsea, César Azpilicueta has been dubbed as the Premier League’s very best defender by former Liverpool star Jamie Carragher. And that praise should be echoed for a player who brings versatility – from a full back to a winger, who can more than hold his own as one of three central defenders in manager Antonio Conte’s favoured formation. Azpilicueta has already helped goalkeeper Thibaut Courtois – who was my second choice stopper for this team – achieve 11 clean sheets in his 18 appearances so far this season, and he will be a vital reason for Chelsea winning the title in 2017 should their recent form continue. Part two of my ‘Team of the Year’ features the ‘front six’, with an inclusion of two Englishman who have, unexpectedly, become two of the most feared players in the division. The midfield includes another two players who have thrived in England’s Premier Division since their recent moves from abroad, as well as two very different central midfielders who have contributed immense amounts to their respective teams in 2016.